Vegetables. A must-have for every kitchen! Availability: Usually Ships in 2 to 3 Days. 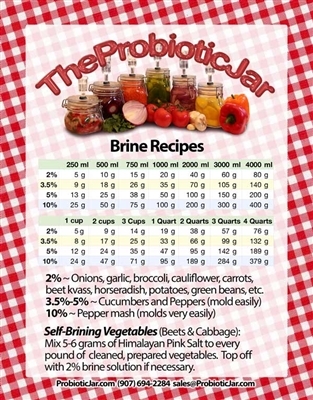 This postcard sized magnet (4.25"x5.5") will really help you mix brine correctly! 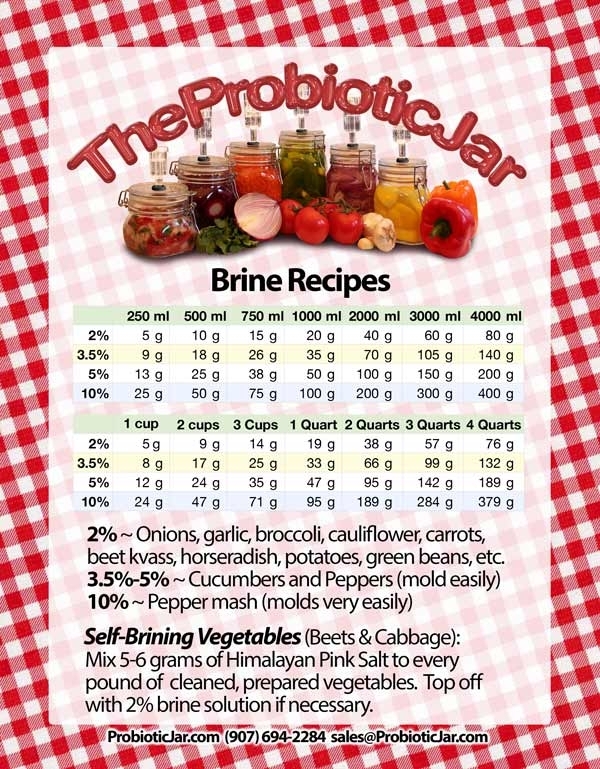 With both English and Metric measurements, and all the brine concentrations that are needed when pickling in The Probiotic Jar(tm). Includes a handy guide for each concentration to use with different vegetables, and how to measure salt for Self-Brining Vegetables. A must-have for every kitchen! Shiny vinyl finish wipes clean easily. Features both English and Metric Brine in varying concentrations at varying volumes. In a perfect world it would be a bit bigger/easier to read. But still it’s a great & smart item to have. Arrived super fast! Sauerkraut tastes fantastic. I had never fermented before. I purchased Kraut Source Lid and Probiotic Lid. The Probiotic Lid is superior based on TASTE. I recommend using 5L Jar with Probiotic Airlock lid - do not use the outside leaves of the cabbage. Order the Probiotic fridge magnet with the salt/brine. It is okay if you have to add most of the brine - sometimes growing your own or buying a super fresh "just picked cabbage" is not possible sadly. The results are still amazing with this product. Our favorite flavor was after 11-12 weeks of fermentation (in the fridge after the first weeks at room temperature) Follow the instructions on the probiotic website.